I’m not even sure where to begin other than to say these burritos absolutely have rocked our world. They left us speechless (probably because we were all to busy shoveling them in our mouths). I think we may have found our new favorite meal and I think I may have hit rockstar status with my boys after making these. If you live near a Cafe Rio, I’m sure you’ve experienced their amazing sweet pork, if you haven’t, you need to. It’s our favorite. My boys always order the smothered pork burrito so they were a wee bit excited when I made these for dinner the other night. Granted, nothing can compare to a Cafe Rio burrito, but these are a pretty dang good runner-up. You will love these because absolutely delicious and because they are so simple to make . . . I love letting my crock pot do most of the work. 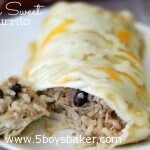 Truly these burritos rock and you have got to make them! Trim any large fat pockets from the pork roast. Cut the pork into 2-3 large pieces and season each piece on all sides with salt and pepper. In a large nonstick skillet, heat the oil until hot. Add all the pieces of pork and brown on each side, 2-3 minutes total. Transfer the pork to a 5-6 quart slow cooker. Add the liquid smoke and 1/2 cup water. Cook on high for 4-5 hours or on low for 8 hours. While the pork is cooking, prepare the rice. In a skillet or medium saucepan, melt the butter and add the rice. Stir, letting the rice and butter cook for 1-2 minutes. Add remaining ingredients (broth, salt, pepper, lime juice and zest, cilantro and cumin) and bring to a boil. Reduce heat, cover and cook for 15-16 minutes. Remove from heat and let stand, covered, for 10 minutes. This can be made ahead and refrigerated until ready to assemble the burritos. Remove the pork from the slow cooker and shred. In a large bowl, toss the shredded pork with the brown sugar, 1/2 cup of the green sauce, chili powder, salt and pepper (add more salt and pepper to taste if needed). Add the hot sauce, if using. Stir in the beans, rice and cilantro to the pork mixture. Lightly grease a 9X13-inch baking dish with cooking spray and spread about 1/2 of the green sauce on the bottom. Warm the tortillas lightly in the microwave. Scoop about 1/2 cup of the meat mixture into each tortilla and sprinkle with a bit of cheese (make sure you save some cheese for the top of all the burritos before they bake). Roll up burrito style (folding the ends in and rolling). Place the burritos seam-side down in the prepared baking dish. Pour the remaining sauce over the burritos and sprinkle with remaining cheese. Bake at 350 degrees for 15-20 minutes until heated through and the top is bubbly and slightly golden. Serve immediately. To make the dressing, combine all ingredients in a blender and blend until smooth. Drizzle over cooked burritos if desired. The only thing I would do differently next time is leave out some of the rice, maybe a cup or so. The pork to rice ratio was a little heavy on the rice I thought. The recipe over at Mel's Kitchen called for 6-8 tortillas, but I ended up getting more like 10-12 and I filled mine pretty full. If you end up leaving a little bit of the rice out, you will probably be able to still fill 8-10 tortillas. Also, we pour the Cafe Rio creamy tomatillo dressing on everything we ever order from there so I made a batch and we drizzled it over our burritos. . . absolutely scrumptious so I've included my favorite copy cat version of the Cafe Rio dressing.